Nobody wants to receive a cancer diagnosis. In fact, few things are more frightening. 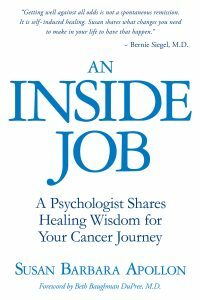 But if you are reading this book, it’s likely that you or someone you love has just heard those dreaded words: “You have cancer.” While I can’t remove this experience from your path, it is my hope that the following chapters will help you to find a new way to think about the journey you are on. I approach the unwelcome visitor called cancer from two different, yet intertwined perspectives. First, I myself am a breast cancer survivor—and breast cancer, unlikely as it may seem, ended up saving my life. In the course of the diagnostic tests required for my radiation and surgeries, my doctors discovered a life-threatening tumor on my adrenal gland. It was removed, and I am here to write these words to you. Cancer is a deeply personal issue for me. Second, I am a psychologist with nearly three decades of experience. Many of my patients have been diagnosed with cancer. They don’t come to me for statistics and conventional medical advice—as is probably the case for you, they are working with capable teams of medical professionals. Instead, they allow me to help them face the very real obstacle called FEAR and receive the gifts of spiritual, emotional, and often physical healing that lie on the other side. While you and I likely won’t speak face-to-face, I am nevertheless honored to share much of the same healing wisdom and hope with you. In the nearly 30 years I have worked with cancer patients, some have died from this disease. However, more have survived—and with an improved quality of life. Why is this? While there are many potential reasons, I believe my patients’ perspectives and attitudes regarding their situations had a huge impact on their healing. In short, my patients chose to view cancer as a wake-up call for life. Whether you’re a patient or a caregiver, cancer enables you to become conscious of what you intuitively know to be healthy, meaningful, and good for you. And if you gravitate toward and focus on those things, I promise, you will make substantial changes in your life. Healing, whether from cancer or anything else, truly is an inside job. While neither I nor anyone else can make promises, there is a very real possibility that you or your loved one could experience physical healing. What I can guarantee, for anyone who does the “work” described in this book, is spiritual healing—a restoring of the vibration of inner harmony, balance, and peace within you. In fact, the good news about being diagnosed with cancer is that it often becomes the catalyst for “growing” your soul and your spirit, all of which enables you to feel more whole and at peace. Please believe me: Right now, you have a choice. You can choose to view cancer as a tragedy and a curse. Doing so will only mire you in destructive anxiety, grief, anger, and fear. However, you can also choose to perceive cancer as an opportunity to take a good look at how you’re living your life and whether it is working for you. Saying “yes” to this wake-up call will shift you energetically to a place where healing is more likely to occur. You’ll find there are three parts to this book. Part One explores the energetic aspects of wellness and healing. It will help you understand your body’s energetic makeup and how it factors into your healing journey. It will also explain why living with stress, anger, worry, unprocessed grief, and other “low vibration” emotions may suppress your immune system in a way that allows cancer to develop. In Part Two, by far the biggest section of this book, you’ll discover a wealth of strategies and techniques for embarking on your healing journey. My intention is for you to embrace the tips that resonate with you and leave the rest as you seek to create a life filled with peace, love, positivity, and even joy and fun. Part Three is written specifically to provide you with an understanding of how integrative medicine can support your healing journey. To further assist you, a group of highly respected doctors who are known for genuinely caring about their patients offer personal perspectives regarding their own practice of integrative medicine. If you are a cancer patient, I urge you share this book with your loved ones. It will help them understand the journey you are on, which in turn, will empower them to be as supportive and helpful as possible. Finally, as you read this book please remember that the Chinese symbol for crisis, difficulty, struggle, and challenge is the same symbol used for opportunity. Ask yourself: Do you want to be a victim or a victor? Will you view cancer as a curse or as a gift? The choice is yours and it will impact every moment of the rest of your life—whether that time is measured in decades, years, months, weeks, or even days. Cancer saved my life in more ways than one. I firmly believe it can do the same for you. My goal is to help you make choices that enable you to reclaim the tremendous power you’ve forgotten you have—and to remind you of how extraordinary you really are. Wishing you a beautiful and happy Easter Day!